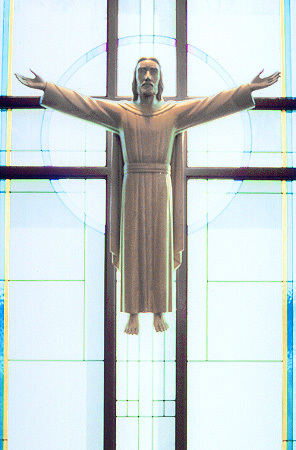 ANDRÉN & KNAPP - STATUES, "Risen Christ"
This very dynamic statue was designed for Ascention Lutheran Church in Ocala Florida. It hangs in front of a window by our friend Yvonne Barlog. It is hard to photograph because either you focus on the window or the statue, not both. Using sculpture and stained glass together can be very dramatic.